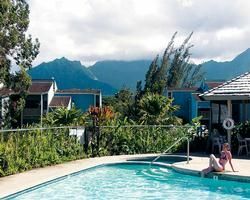 Kauai, the “Garden Isle”, is a favorite of vacationers and it may become your favorite island, especially if you stay at Makai Club at Princeville. With its idyllic location above the turquoise waters of the Pacific and alongside a championship golf course, Makai Club is the ideal home base for your exploration of Kauai. When you buy a timeshare for sale at Makai Club, everything this gorgeous island provides is at your doorstep. Enjoy your morning coffee on your private lanai as you gaze across a lush garden landscape of tropical plants and flowers. One bedroom/1 bath condos or 2 bedroom/2 bath cottages are bright and airy with island-inspired décor and furnishings. Each features a dining room, living room, pull-out sofa, and fully equipped kitchen where you can prepare a full meal, or pack a lunch (cooler included) to take on your island adventures. Amenities include flat screen TV/CD Player/DVD, iPod Dock, Wi-Fi internet access, ceiling fan and telephone. There’s never a dull day in paradise. Spend your day swimming in the Makai Club’s sparkling pool, lazing in the Jacuzzi or using the complimentary beach chairs and mats at the nearby beach. Golfers rejoice—the newly refurbished championship Makai Golf Course is just steps away. Sign out a bike at the concierge desk and ride around the scenic Princeville Resort area, or explore the island by rental car, helicopter or kayak. Contact Makai Club at Princeville Specialist Today!